CAMBRIDGE — Martin Karplus won the Nobel Prize for Chemistry in 2013. Sixty years before that, his parents gave the future Harvard professor his uncle’s Leica. Thus was a second career born. Chemistry and photography go together. Any analog photograph is the result of a series of chemical reactions. It’s chemistry in aesthetic action. Karplus has a predecessor as a local scientist-photographer. The late Jules Aarons , a Boston University physicist, spent several decades chronicling Boston neighborhoods with his camera. Aarons took black-and-white photographs, Karplus color. As it happens, the first color image was a collaboration between a photographer named Thomas Sutton and the great physicist James Clerk Maxwell. In “Color Images From the 1950s: Kodachromes by Martin Karplus,” he does the work of both. The exhibition runs through June 25 at the Cambridge Public Library. Color formats can vary considerably. Kodachromes have saturated, even lush hues. Karplus uses that lushness to excellent effect. A woman standing in the foreground of a photograph wears a red hat and coat — a really red hat and coat. 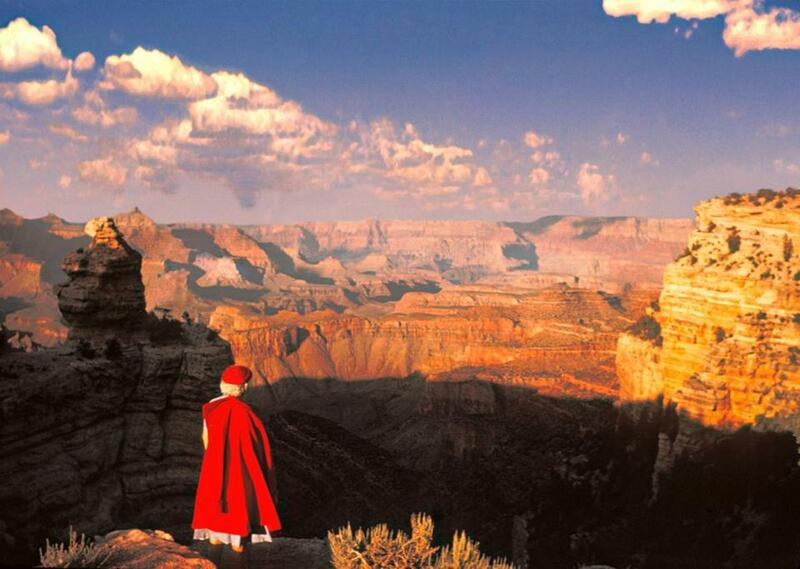 The degree of redness matters, because in the background is the Grand Canyon. The richness of the red lets the woman hold her own visually with not just the canyon’s delicate pastels but even its flabbergasting geology. 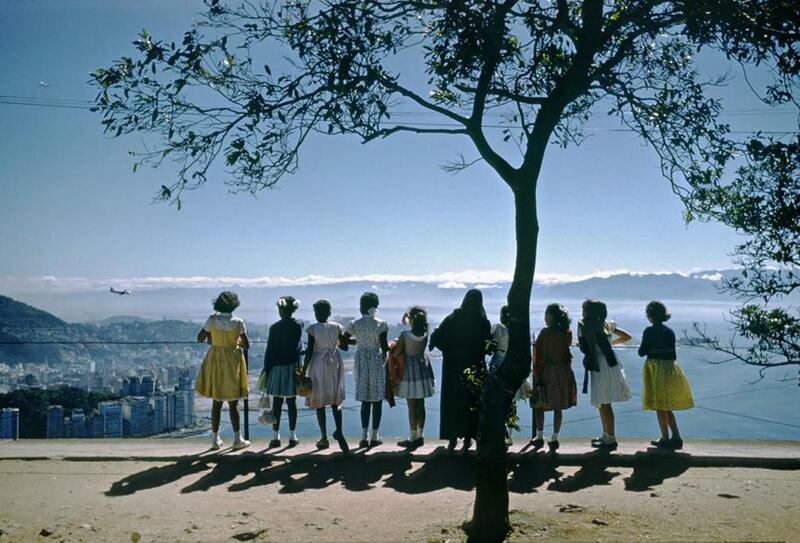 Conversely, in a view of Rio de Janeiro, the blueness of sea and sky is radiant rather than lush: an opening up rather than a thrust against. Look closely at the Rio photo and you notice how much else is going on. A line of onlookers, a bank of clouds, and the horizon make the picture triply horizontal. Yet Karplus includes a tree in the foreground as a countervailing vertical. The sense of balance is deeply pleasing. Look more closely and you notice the nice visual fillip of a jet descending over the harbor. Karplus has an eye for such details. There’s the sight of a Coors sign planted smack in the middle of a Silverton, Colo., commercial block. Or the casual elegance with which a man holds his cigarette, as he sits by a storefront in Flagstaff, Ariz. On display in the window are a pair of boots. The smallest of tags informs us that they’re Tony Lamas. The 28 photographs cover a lot of territory geographically — Denmark, Peru, Mexico. There are some spectacular images here, of Hong Kong harbor, for example, and the Iguazu Falls, in South America. None feel touristy, though. One reason is Karplus’s use of a long-focus lens. It allows him to keep a respectful distance even while attending to his human subjects closely. A more important reason is a sense of human engagement and alertness. That man in Flagstaff is Native American. A group of people in Urbana, Ill., is biracial. Two women leaving church in Sudbury are African-American. At a time in this country when people of color were rarely seen or heard, Karplus made sure he saw and heard. The Karplus photos hang as a group outside the library’s lecture hall. Several of Diane Asséo Griliches’s “Library: The Drama Within” photos are there, too. But most of the 22 images are on two other floors and a staircase. Finding them is a bit of a “Where’s Waldo” challenge, which is annoying, but it’s also a way of weaving them into the function of the library, which is kind of great. Griliches cherishes libraries, and anyone who cherishes libraries will likely cherish these photos. They’re in black-and-white, and undated, which gives them a slightly timeless quality. Libraries can be very grand, and Griliches shows some of the grandeur: Bates Hall, at the Boston Public Library; the facade of the New York Public Library, on 42d Street; reading rooms in the Library of Congress and Paris’s Bibliothèque Sainte-Geneviève and Bibliothèque Nationale. Libraries can be familiar and, if you’re lucky, nearby. Griliches visits the Newton Free Library, the Uphams Corner branch of the BPL, the Chelsea Public Library, and the Shrewsbury Public Library’s bookmobile — which does some visiting of its own. Libraries can be as intimate, and unexpected, as the imagination. The public library in Pembroke, Va., used to be the town’s post office. It’s so small Griliches had to stand outside to photograph it. In Cleveland, Miss., the library used to be the train depot. Which makes sense: Both libraries and trains can take a person to such interesting places. Libraries can also be mysterious. Some lucky professors get to have an office in the stacks at Harvard’s Widener Library. On the door of one such office is a poster of Berenice Abbott’s portrait of James Joyce. The way the photo is lit Joyce could be a ghost haunting the books — or god presiding over them. The city seen in the 20 black-and-white photographs that make up “Olive Pierce: Photographing Cambridge, 1970-1986” isn’t the Cambridge of Harvard and MIT. Nor is it the Kendall Square and biotech Cambridge of today. Instead, it’s the Jefferson Park housing project, in North Cambridge. It’s the public high school, Cambridge Rindge and Latin. The images are gritty but suffused with the hard, modest elegance that endurance can bring forth. Pierce, who died in 2016, helped found the photography program at Rindge and taught in it, so she knew the school and its students well. 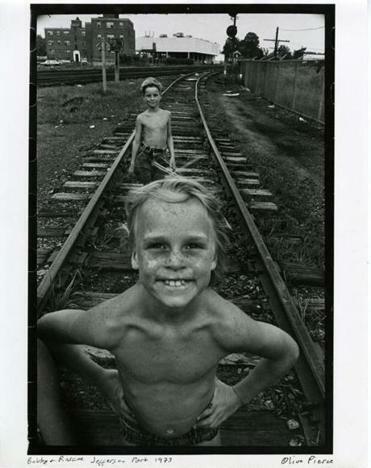 She photographs them with the interest of an outsider and assurance of a citizen in good standing. With just a few images — a dance class, a welding class, the senior prom — she conveys the sense of a small, vibrant society. These pictures, like those of Jefferson Park, are loving but in no way sentimental. In their very different way, that’s true of Karplus’s and Griliches’s, too.